Dorner Mfg. will be exhibiting several of its major conveyor platforms aimed at the food, packaging, industrial and automation industries; including its new AquaPruf VBT, in booth No. 5010, at WestPack 2016, Feb. 9-11, at the Anaheim Convention Center in Anaheim, California. The new AquaPruf VBT (Vertical Belt Technology) is engineered to move bulk products in straight-up 90° sanitary applications. The VBT features a proprietary staggered sidewall belt designed to increase pocket capacity and improve product release compared to a traditional sidewall belt. 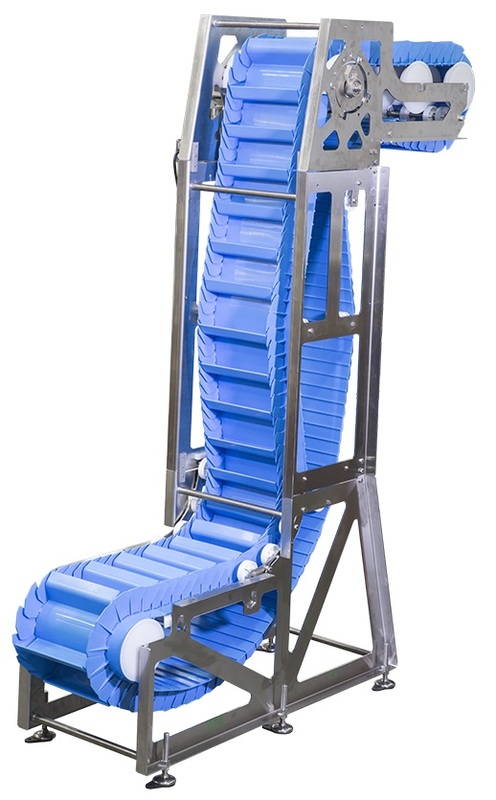 The conveyor comes with an open frame design for quick cleaning, more effective product changeover, and overall less maintenance versus a traditional bucket elevator. The AquaPruf VBT is perfect for elevating bulk products such as vegetables, fruits/grains/nuts, popcorn, pet food, pharmaceuticals and small packages in applications including elevation for walk-thru, hopper feeding, weigh scale feeding, general bulk handling and sanitary environments. Another one of Dorner’s newer conveyor platforms, the SmartFlex Spiral is capable of twisting 360 degrees to move product vertically within an extremely small footprint. It features a patent pending chain design that allows the conveyor to maintain speeds and loads through the angled curve. Finally, WestPack attendees can be the first to see Dorner’s latest innovation, the 2200 Series Universal Drive. The universal motor and mounting package covers all speeds and loads within the 2200 line and can be mounted in up to 15 different positions, giving the user complete flexibility and simplifying the ordering process. The universal drive features a high torque run at a low speed, completely eliminating the need for a gearbox. To see how all these conveyor platforms can help your material handling applications, make plans to visit Dorner in booth No. 5010 at WestPack 2016.